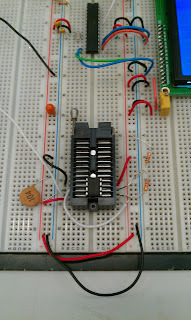 Here is a new circuit devolped for Owen (KB1CGP). 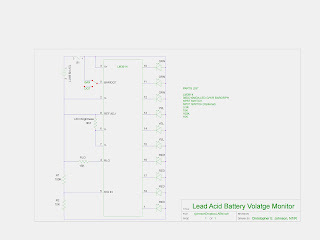 This is a sealed lead acid battery monitor that uses the venerable LM3914. 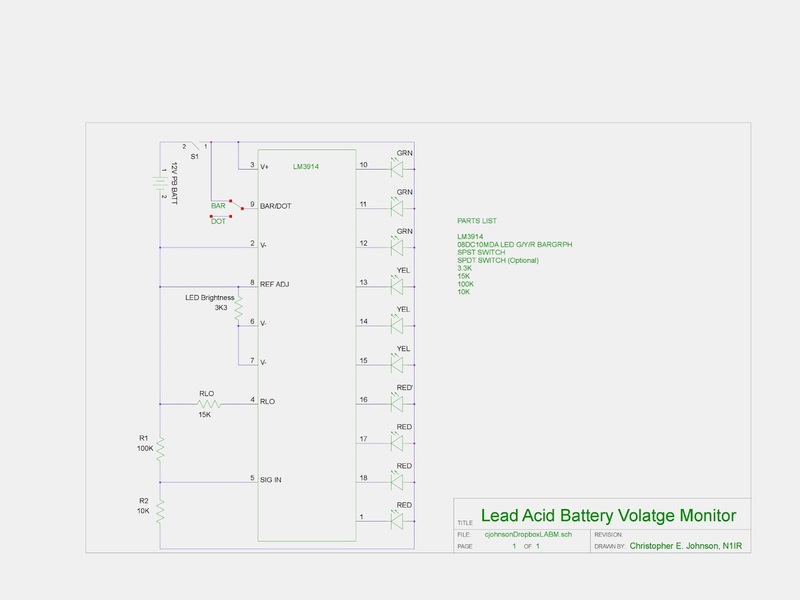 The design criteria was to have a multicolor indication of a specified voltage on a battery. 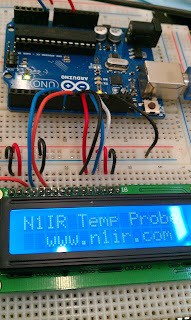 I decided to go with all off the shelf with fixed value resistor that did not need any calibration required. Some other circuits I have seen online use a pot to change the ratio of the measured input voltage or change reference voltage of the ten internal op-amps. 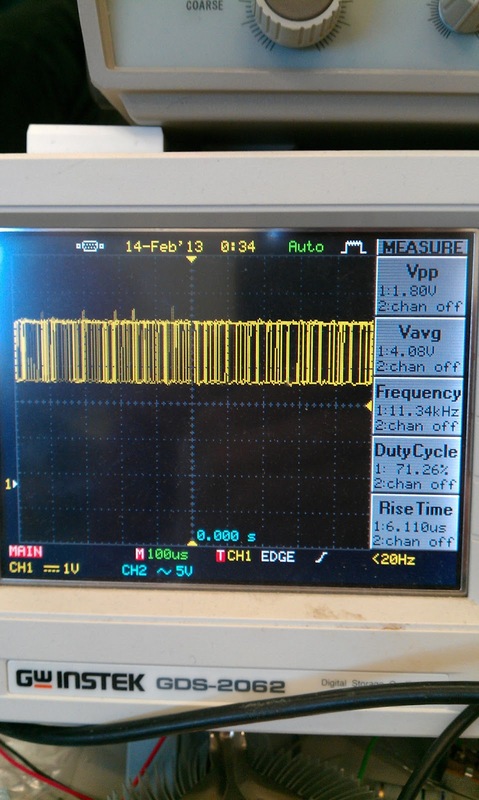 Much of the display flexibility derives from the fact that all Display outputs are individual, DC regulated currents. 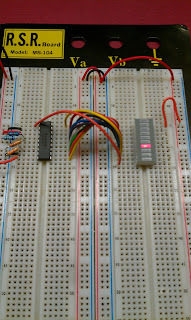 Various effects The LM3914 is a monolithic integrated circuit that senses can be achieved by modulating these currents. 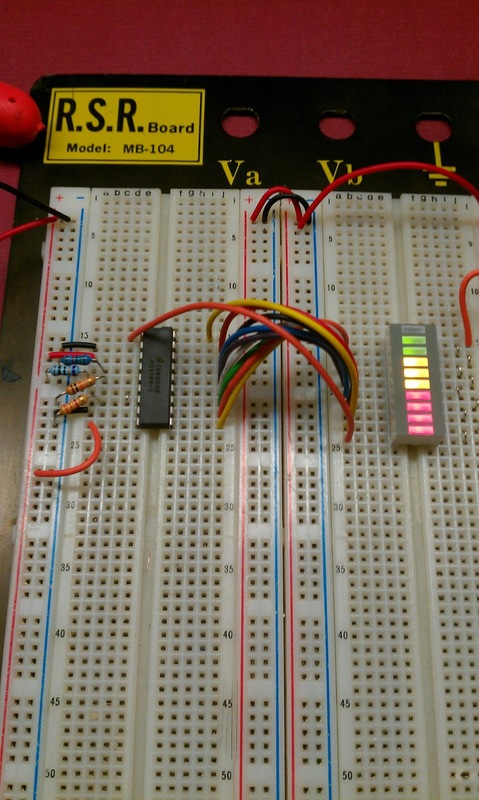 The analog voltage levels and drives 10 LEDs, providing a linear individual outputs can drive a transistor as well as a LED at the analog display. 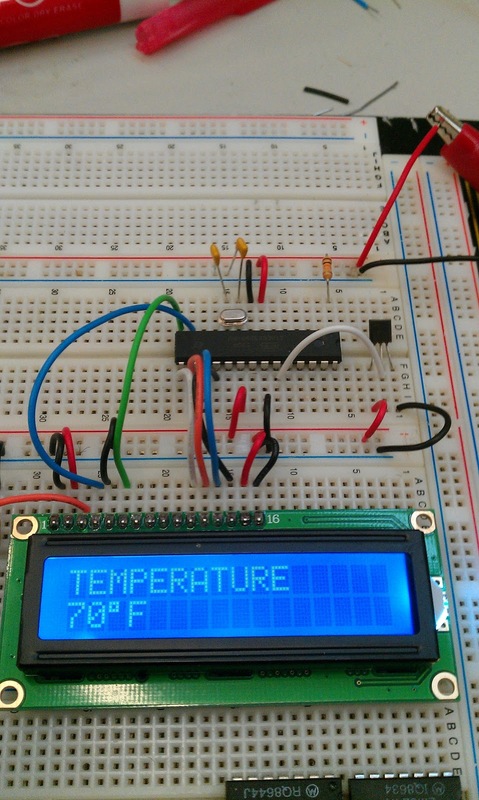 A single pin changes the display from a same time, so controller functions including "staging" control moving dot to a bar graph. 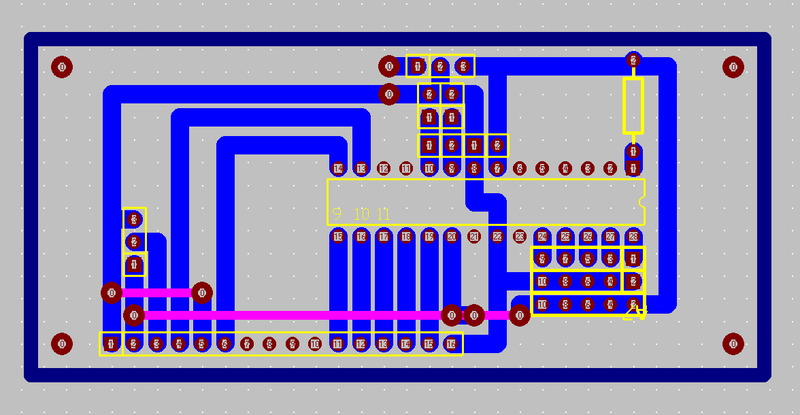 Current drive to the LEDs is can be performed. The LM3914 can also act as a program- regulated and programmable, eliminating the need for resis- mer, or sequencer. Driver tors. This feature is one that allows operation of the whole The LM3914 is rated for operation from 0°C to +70°C. 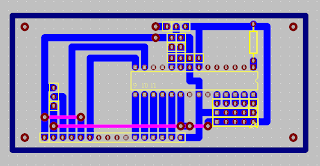 There is also a LM3915 for Log measurement in 3db step, this IC is great for VU meters I've designed in the past. 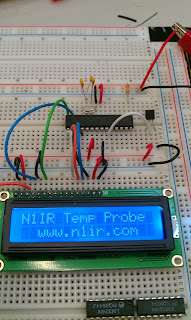 This was a better result 13.75 max voltage and the red LED would turn on at 11V, the compromise was now the input voltages were not a nice round numbers, this is not to big of a deal it's being used at a gas gauge, but a table can be printed on the side panel of the meter with the voltage level to the corresponding LED. 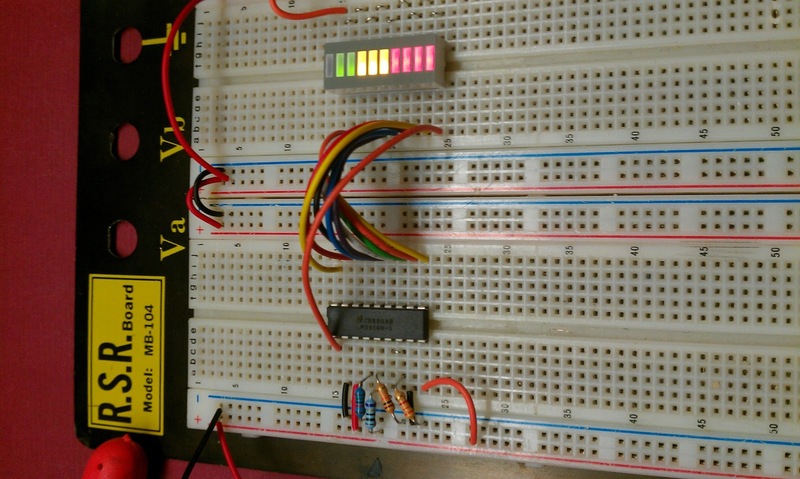 This worked out great RED = Dead, YELLOW = Almost dead and GREEN = OK plus no calibration just 1% tolerance resistor which I have on hand. PCB GERBER FILES COMMING SOON !!!!! So thinking back to when I was in automotive exploratory, what makes an engine go? Air, Fuel and Spark. Definitely had fuel that tank was full and the smell of gas was coming out the muffler. Air, checked the filter no blockage, Spark was okay, got zapped by accident, scared the crap out of my wife, lol. 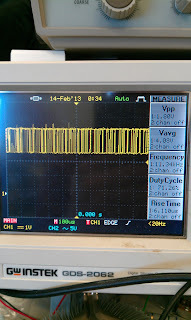 Decided to give a compression test with my meter, found 0 PSI, oh sh!*. Tested the mower next to me to see if the meter was bad, nope worked okay. Off to big box store for a new generator that morning, luckily they just got a shipment in of 200 in a truck, I was second in line when the door opened. I had no idea what I was buying, all that was known was it was 5000 Watt. Come to find out after working on it, change the oil after the first 20 hours! It was a really good generator, the engine was a Honda GX390 clone and exact copy. It uses 10w-30 oil very common unlike my old generator. Got the GX390 parts manual online and the service manual online. I would recommend an additional 1 foot of 1/4 inch fuel line to making draining the tank easier. Also you need a L14-20 Plug if your using the 240V line, my old generator was different plug (another story). Runs really good with a one pull start, very well build, heavy duty frame. 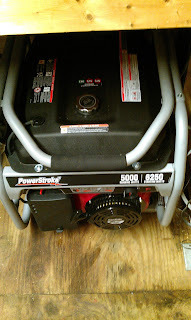 A week later I decide to take a look at the old generator, from what I gather it was a Briggs and Stratton Intek OHV 18HP Model 204400. After finding a couple of youtube video online they are notorious for head gasket leaks. In hindsight it did burn oil about 2 oz every 4 hours of operation. After opening the OHV I found a thrown push rod, I guess what happened it the oil got low and pushed the rod out There is no guide or anything to hold the rod in-place except the cam and the rocker. I also found the intake valvle way out of spec a .04 inch gap (should have been .004). So I inspected the rod and down into the cam, looked okay so put the rod back in and adjusted the valves. Put it back together and it fired right up! I've ordered a new head gasket and OHV gasket, I will post the tear down and replacement another day. 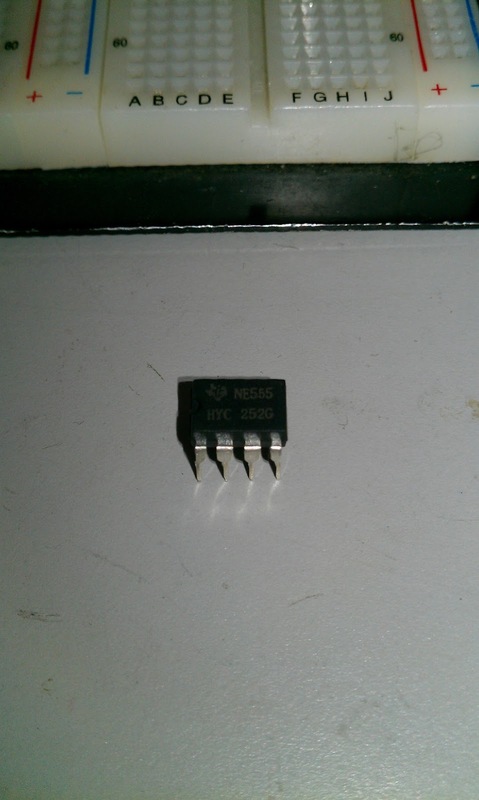 Just orders 100 NE555 Timer off ebay for $9.98 with shipping . Got it within 10 working days via 1st class China Post. Each chip cost around $0.09 each. 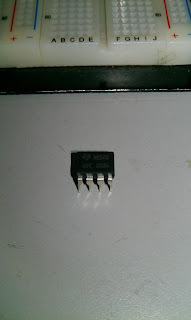 This chip was marked with the Texas Instrument logo NE555, HYC 252G. I have no idea if they are genuine they are probably grey market re-badged. Our normal distributor each chip is $0.24 per 100 with shipping not included. Also a lead time of 2 months with our PO system (snail mail) and shipping (UPS ground). Overall we order about (5000) NE555 per year, so if we switch over to China we would save about $700 per year, but the catch is you need an ebay account and a credit card, slim chance of that happing. I tested all of them in a astable mutivibrator circuit with a 97% pass rate, 3% failed with voltage output issues, they did oscillate at a frequency but at a diminished voltage. A 97% pass rate is fine for what we do, all of our designs we add an IC socket so if it fails it's an easy swap. 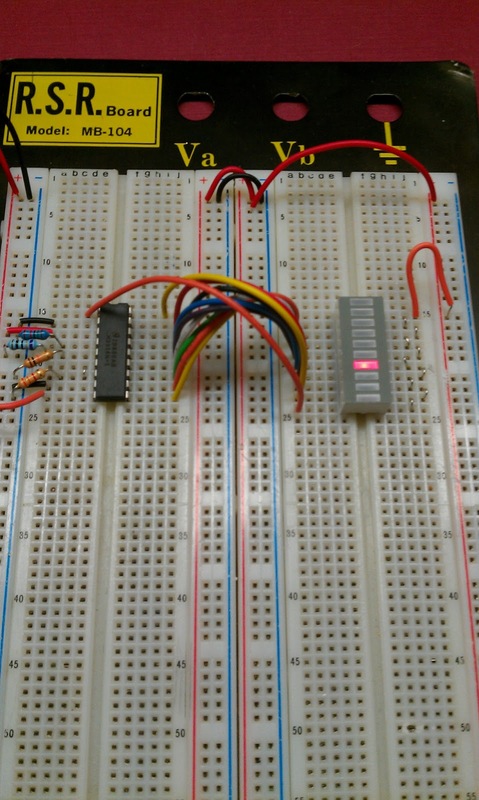 Also our circuits a novelty items (buzzers, LED flashers, etc.) and laboratories, there not in high reliable systems / life support or in safety systems. One chip I tested was really strange. 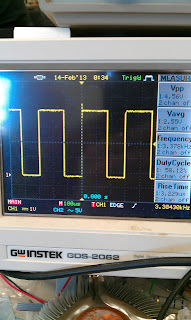 It ran about 40 times higher frequency that what the other comparison chips in the circuit. 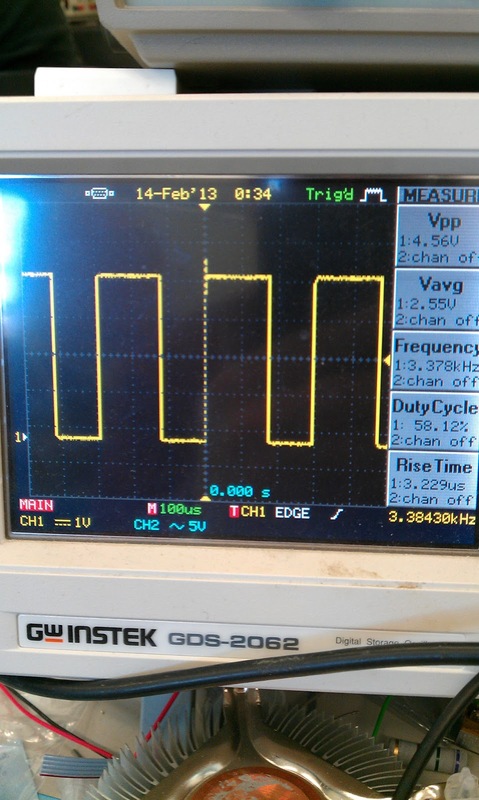 I placed the chip in the circuit a half dozen time and it came back to life, really weird. I set up a zif socket and a few resistor and caps, 2K, 1K, and a .1 uF cap and a 1uF cap as a filter cap on the supply. Here a new project that I designed for the freshmen. It's based on the ATMEGA328 / Arduino. 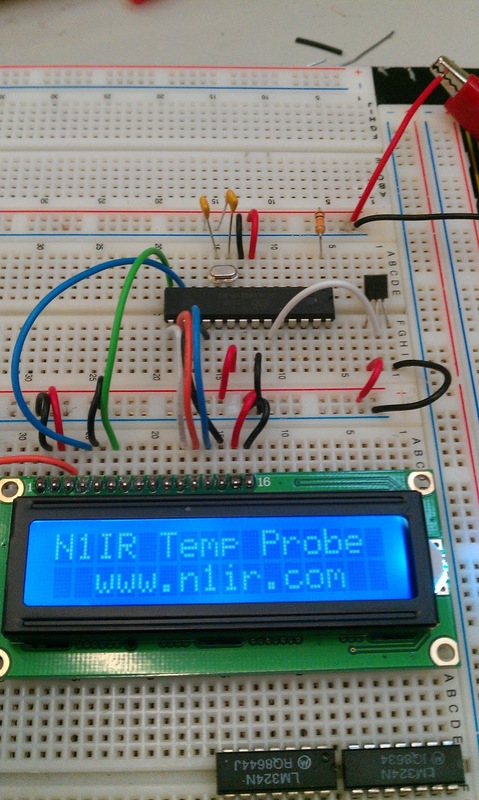 This is a replacement project, the cost of older components were getting prohibited thus we discontinued the temperature probe project a few years ago. 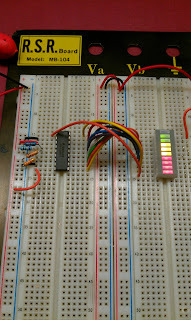 In the old project we used PM-128E voltmeter and the LM34, the old project cost was around $30 for the meter and the LM34. 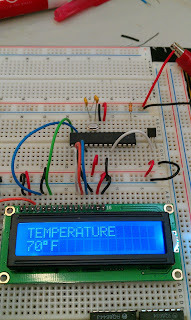 Since the new redesign with the ATMEGA328 at $1.60 and the Blue LCD direct from China $2.20 and the new temperature sensor MCP9700 at $0.19. Total cost around $3.99 each for a lot of 100.